When the teasers for this book hit the ‘net, it left many wondering what to expect. All we knew was that Grant Morrison (We 3, Superman) would be at the helm, and that Darick Robertson (The Boys) would bring the story to life as the artist. 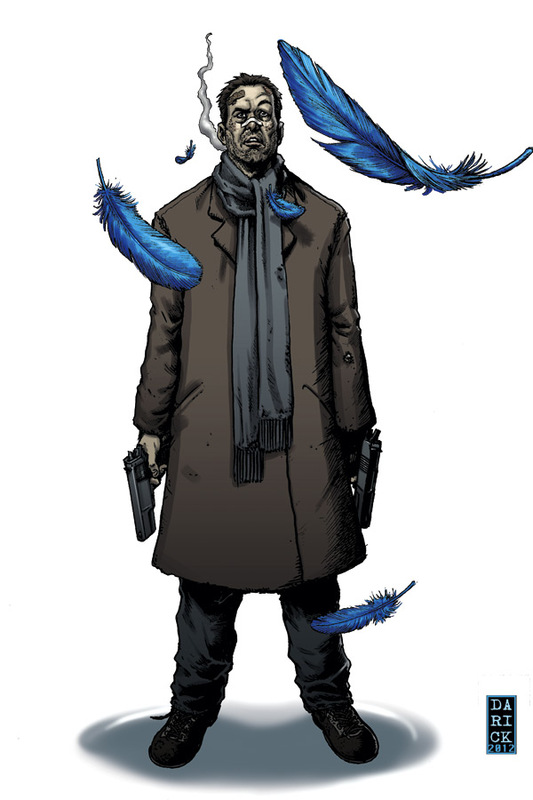 Oh, and an image of a beat up, scruffy man with a gun, with blue feathers floating prominently in front of him. Well, the book hit this fall, and it is already being developed as a feature film. Is the book really that good? Happy! focuses on Nick Sax, a former cop turned hit-man who has seen better days. After a hit goes awry, Sax ends up with a bullet in his body for his troubles. It all plays out in the similar style of another Robertson book, The Boys, as bullets and vulgarities fly, but all that changes by the end of it. It’s Christmas time, and Sax gets about the most unexpected gift in the form of Happy. What you get is a “WOW” moment that can turn the series into something totally different from the first issue, and that’s a refreshing thought. Morrison crafts a hard boiled, mature modern day holiday tale that looks to throw everyone for a loop. Robertson is used to drawing the violent and obscene with The Boys, so he is a perfect fit for this soon to be classic series. By the end of it, I couldn’t wait for more, as it has me hooked. There’s a reason this is being made into a live-action film: the creativity of it all oozes off the page and burns a spot on your brain. Highly recommended, I give Happy! #1 a perfect @@@@@ out of FIVE. Next CW's Arrow Picked up for a whole season + Check out Deadshot!